This image shows a 3-pound bag of unakite rough, dumped into a colander and sprayed with water to reveal its full color. Click on the image for a larger view. This rough shapes quickly in a tumbler and produces beautiful green and pink tumbled stones. Unakite is an interesting igneous rock composed mainly of pink and green mineral grains. There are very few rocks made up almost entirely of orangy-pink and yellowish-green minerals, so, once you are familiar with unakite you should easily be able to identify it when you see it again. Unakite is named after the Unaka mountains in western North Carolina and eastern Tennessee. It has been quarried there for ornamental and construction stone since the mid-1900s. It has been used to make flooring tiles, facing stone, curbing stone, paving stone, stair treads, countertops, window sills, lentils, ashlars and many other products. Unakite is also found in many other parts of the world. Today, much of the unakite used in dimension stone and lapidary projects is quarried in South Africa, Sierra Leone, China, Brazil and Zimbabwe. The unakite being sold here is from South Africa. The orangy-pink mineral in unakite is orthoclase, a mineral of the feldspar group. Orthoclase is the mineral with a hardness of 6 used in the Mohs Hardness Scale. The yellowish-green mineral is epidote, a rare mineral found in a small number of igneous rocks and low-grade metamorphic rocks. Unakite is an igneous rock that is very similar to granite. Much unakite forms when granite is altered by hydrothermal metamorphism. The main difference between granite and unakite is the presence of significant amounts of epidote. Unakite is slabbed and cut into cabochons for jewelry use. It is also cut into beads, and tumbled into polished stones. 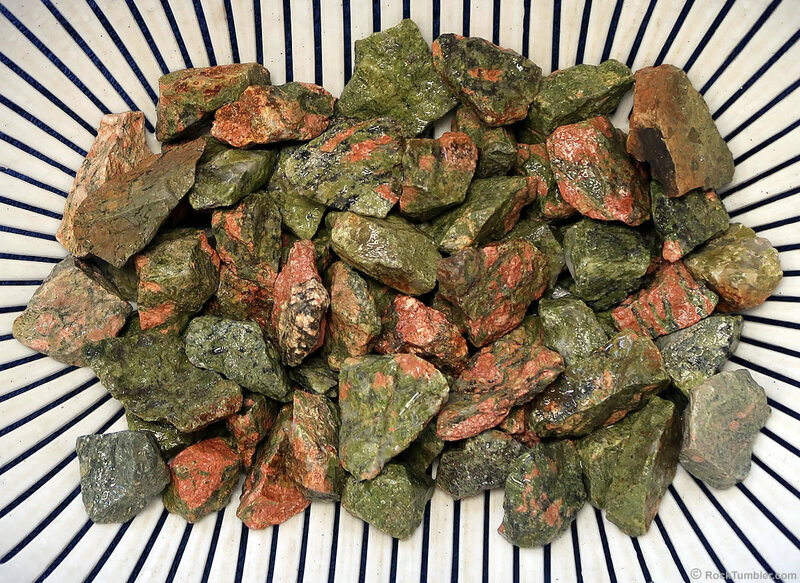 Unakite is used to make spheres, desk sets, vases, small sculptures and many other objects. It is a popular carving and bead-making material because it works easily, and, its hardness of 6, allows it to shape more quickly than quartz, agate, jasper and other common materials. 1) Shapes Quickly: Most of the minerals in unakite have a hardness of 6. So, they will require less tumbling time than jasper and agate to achieve a nice shape. If you tumble too long you will lose weight. 2) Media Needed: Both orthoclase and epidote have perfect cleavage - and they cleave easily. So, they must be tumbled gently to prevent breakage and bruising. We recommend using at least 25% media during the medium grit, fine grit, and polishing steps. Burnish If Needed: If you have done a good job of tumbling, this tumbled unakite will have a nice soft glow. It will not have the "glassy" polished luster that you can produce on agate. Burnishing will probably not be needed, but if you want to clean up the rocks, you can find the full burnishing instructions here.